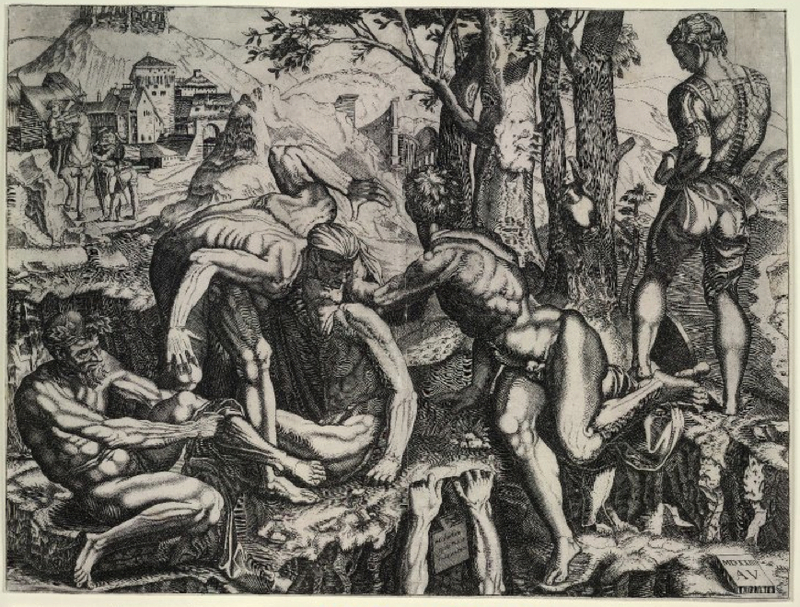 In a recent short paper entitled The Mystery of Michelangelo's Battle of Cascina I argued that the hands of a man who seems to be drowning in the water are the hands of the artist. As others have pointed out the print's narrative is inconsistent because the man leaning down into the water to offer help on the left is nowhere near the hands asking for it. In my reading, explained elsewhere, we are inside Michelangelo's mind where the hands in the river are the hands of the artist "creating" the disconnected figure studies above, as if they were an inversion of the hands of God. 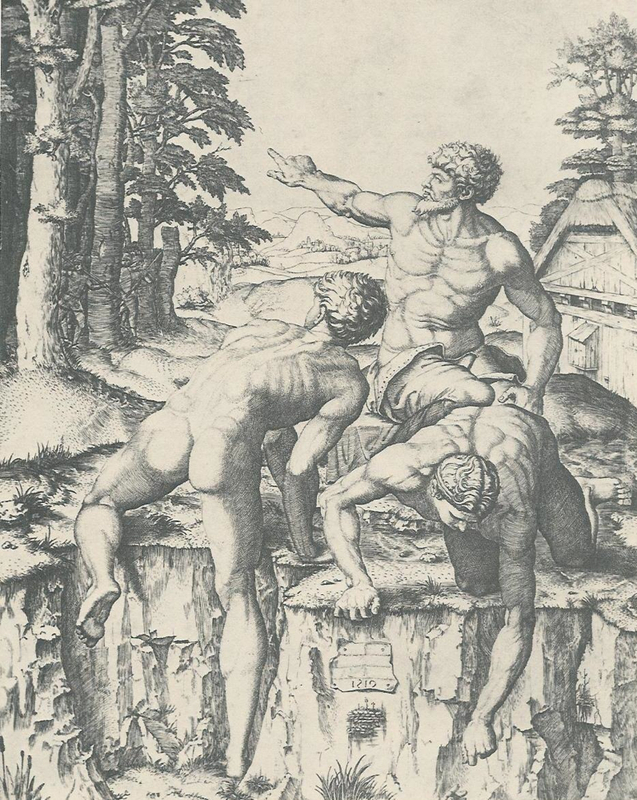 When Marcantonio Raimondi later engraved three of Michelangelo's figures onto a different background, he subtly "corrected" the inconsistency by adding just a tiny glimpse of two fingers in the water directly beneath those stretching down to help. Nevertheless, years later The Battle of Cascina was engraved again by a different artist who, recognizing the significance of the hands, brought them up the side of the riverbank on either side of a tablet. The inscription is too small to read in available reproductions but it seems to credit Michelangelo. 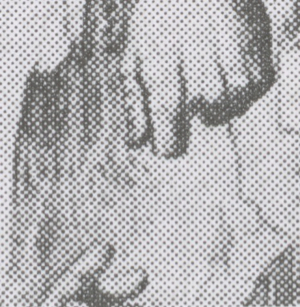 Whether accurate or not, such tablets were widely recognized as sites of authorship in prints so that its placement between the two hands in the water clearly implies that the two hands are the artist's. 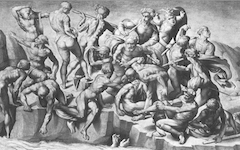 Thus, whether or not we are looking at a scene inside Michelangelo's mind, all previous interpretations still need rethinking because the only battle being fought on this riverbank is Michelangelo's own battle to create the art. 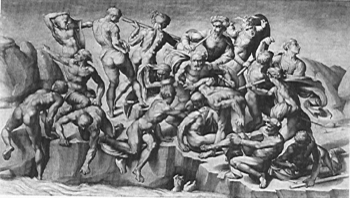 See also Mystery in Michelangelo's Battle of Cascina. 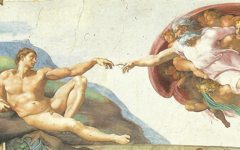 Michelangelo's first great masterpiece is widely misunderstood. Like art in general, it is an expression of the creative moment. Original Publication Date on EPPH: 21 Nov 2011. © Simon Abrahams. Articles on this site are the copyright of Simon Abrahams. To use copyrighted material in print or other media for purposes beyond 'fair use', you must obtain permission from the copyright owner. Websites may link to this page without permission (please do) but may not reproduce the material on their own site without crediting Simon Abrahams and EPPH.